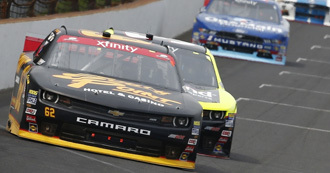 While the NASCAR XFINITY Series is boasted as the division in which “Names Are Made Here,” veteran racer Brendan Gaughan hopes to teach the young kids a lesson during this Chase run. The driver of the No. 62 South Point Chevrolet Camaro has advanced to the second round of the inaugural XFINITY Series Chase and is optimistic the team can be one of the final four to race for the championship at Homestead-Miami Speedway in November. Throughout the entire season, and especially the opening races of the Chase, Gaughan has taken a relaxed approach to things. Rejuvenated by the Chase format, the veteran Richard Childress Racing driver knows he has a serious chance of competing for the championship instead of just competing for another spot in the standings. “Last year, we had a shot for sixth in points. There was a real long, outside shot we could have made it to fifth, but we were kind of stuck in eighth,” said Gaughan. “We couldn’t finish any lower than eighth, but we could maybe gain a few more spots in the standings. Yeah, you’re still racing for it, but are you really getting all that pumped up for eighth or sixth in points? Look, I’m sorry if you get mad, but it’s hard to get pumped up for that. I still want to go out and win every race and run up front, but the standings at that point don’t really matter. One of the team’s biggest assets in this format is crew chief Shane Wilson. A veteran atop the pit box, Gaughan describes his crew chief as ‘Same Same,’ meaning he is a creature of habit who rarely changes and never gets worked up. That certainly came into play throughout the first few weeks of the Chase. Gaughan hit the wall during the Chase opening race at Kentucky Speedway, but was able to rally back to a sixth-place finish. Last weekend at Kansas Speedway, Gaughan was pinched down off the fourth turn, slid through the grass and heavily damaged the car. Despite the damage, Wilson and the crew got the No. 62 Chevrolet Camaro back on the track to finish the race. Heading Texas Motor Speedway in two weeks, Gaughan is 17 points behind the Chase cutoff. While other Chase drivers had issues at Kansas as well, Gaughan admits he and Shane will now have to shake things up a little bit to overcome the setback. The team will also have the advantage of brand-new RCR equipment on their side for the Texas race, the second race of Round 2. This Chase format is certainly not Gaughan’s first championship run. In 2003, Gaughan entered the Camping World Truck Series season-finale at Homestead-Miami Speedway leading the championship standings and battling with three other drivers for the title. Gaughan’s title hopes slipped away when he was caught up in an incident just past the 100-lap mark. While the formats were significantly different, Gaughan sees a lot of similarities between the 2003 battle and this Chase format. If all goes according to plan and the team advances to the final round of the Chase at Homestead, Gaughan believes his age and experience will allow him to have more fun and take a more relaxed approach to the winner-takes-all championship race.